A man’s man is that guy who inspires. He’s an archetype. A leader. But not just a leader of those who follow at every opportunity. He’s a leader of leaders. He’s the leader of men who are as strong as he is. They look to him for inspiration. For guidance. We, men, leaders in our own rite, applaud the man’s man successes. A real man isn’t jealous nor envious. With that said, if we do have a tendency to be envious of what others accomplish, it’s impossible to have jealousy for what he is and has accomplished. He’s too damn good at what he does, who he is, and he’s too damn good of a guy to want anything other than incredible success for him. He works too hard and he puts so much into what he does to have anything other than respect for him. After all, he gives us more than we give him. I found out who the Man’s Man of the Year was in September. On a cold and rainy night in Brooklyn, a good buddy of mine – Sean Hyson (check out his site) – and I embarked on a pilgrimage. We braved the elements. We walked. We took trains. We reminisced and laughed, all the while he tried his best to prepare me for what I was about to experience. Not witness, but experience. I make that clarification on purpose. When you see this man. When he performs. You’re not watching. You’re a part of the production. Somehow he connects with you, personally, as well as the 60,000 others standing, singing, here for the very same reason. Sean tried to prepare me, but there was nothing he could have said to make me realize that I wasn’t just going to a concert. And so, on November the 26th, as I embarked on the same pilgrimage, this time with my parents, I tried to convey the same message to them. Now it was I who would try and explain to them what they were about to experience. But it wasn’t that easy. I was trying to tell a 68 (sorry Mom) year-young woman, and a 58-year Old Man, both of whom never attend concerts, that they were about to experience something unlike anything else they’ve ever experienced. … And then, as we sat waiting patiently in our seats at Rogers Arena in Vancouver, the man walked out. That rainy night in September that started in Brooklyn, ended at Meadowlands Stadium, in Jersey. The home state of Bruce Springsteen. That night, a night that saw the show delayed by two hours due to lightening warnings, was a night I’ll likely never forget. One man led a chorus of 55,000 through two and a half hours of songs. Classics. 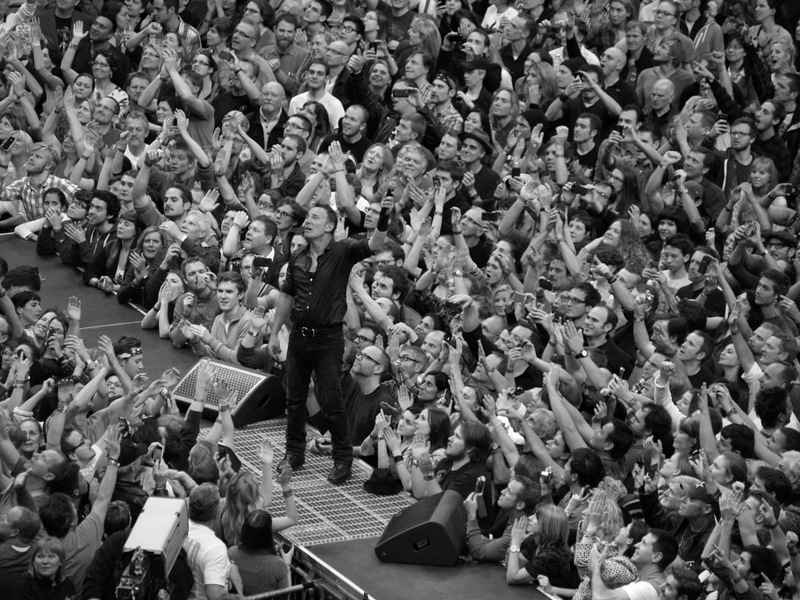 It culminated with the choir of 55,000 singing Happy Birthday to Mr. Springsteen. It was his 63rd – a fact that my parents were weary of going into the concert this past November in Vancouver. They had heard stories, not just from me, about how great a Springsteen concert is. They thought they knew what to expect from a 63 year old man. They thought. Bruce Springsteen is the inaugural Man’s Man of the Year. When I was in Jersey, of the dozens we talked to waiting for 2 hours in the halls of the Meadowlands, I was the only one at my first concert. I soon found out why. In Vancouver, with my parents by my side, I’m sure you can add a couple more to that list that will not stop at just one pilgrimage to see one of the greatest musicians the world has ever seen. They say that true happiness is loving what you do. That if you love what you do you’ll never work a day in your life. They say that to inspire others is what it means to be a real leader. They say that a man is measured, not by his words, but by his actions. That a real man respects women. That a real man isn’t out just for himself, that he either takes others with him, or in doing what he does, he gives something far greater to others. I have never seen a man so in love with what he does. Bruce doesn’t just sing, he brings you in. He engages the crowd, brings an 80 year old woman up on stage and dances with her. He crowd surfs. He keeps his stage low enough that he can sing to his fans. They can touch him, and he can sing to them. When you’re a man of the people, you stay among the people. Bruce Springsteen is one of the most successful recording artists of all time, but there’s no one I’d rather sit down and have a beer with – other than my Mom and Dad. He’s a Man’s Man. Every single person walked out of both shows I went to with the feeling that they just paid peanuts. Like they had somehow stolen something. Even if the ticket was $150, it was peanuts for what you got in return. In Vancouver he played for over 3 hours. He laughed. Paused in memoriam to a fallen friend, and he entertained. His life is without scandal. He has stayed true to who he is for his entire life. He hasn’t ‘sold out’. He hasn’t changed because a record label wanted him to. Is he perfect? Far from it. But he’s passionate, he’s a warrior, and he’s a man’s man. Bruce Springsteen is the inaugural Man’s Man of the Year because of all of the above. Because he’s still madly in love with his wife. He’s a father. He’s one of the few celebrities who isn’t searching for publicity by acting out. He’s maybe the biggest draw worldwide, yet he doesn’t hesitate to shake hands, crowd surf, and be one with the people who love his music. His songs aren’t ‘bubblegum’. Bruce isn’t ‘bubblegum’. He’s real, raw, the guy’s a man. A real man. Take the following songs as examples of the kind of musician he is, and man he is. Bruce knows how to write about ambition, about dreaming, about truly working hard, trying to make your way in the world because that’s who he is. That’s where he comes from. That’s who he surrounds himself with. He isn’t the pretentious celebrity that dominates award shows are airwaves. We wouldn’t blame him if he were. He has every excuse to be that guy. He’s had unbelievable success. He could have taken his money and ran a long time ago. He really doesn’t need to perform. He does because he loves to. Every night he’s out there to prove that he still has it, but also to give that gift he gave my parents in their first visit, and I in mine. Can We Force Ourselves to Love What We Do? Walk out of a Springsteen concert, and you’re in awe. Everyone is. They can’t believe what they just saw. And then you start to think, this guy has been doing that for 40 years. He’s been performing for 4 decades, and it’s like he won the lottery. He was the happiest person in the stadium, and HE was singing for over 3 hours. How the hell am I going to find something I love that much? How do we know if we’re doing what we should be doing? How do we know if we’re on the right path? It ain’t all sunshine and rainbows. No matter what you choose to do with your life, it will never be perfect. So how do we know? I take this idea from Steven Pressfield. In his description of the Resistance, he notes that we can use the Resistance as a guide, a compass. The Resistance is whatever pulls us away from our work or our dreams. The Resistance is procrastination, it’s fear, it’s TV, it’s being lazy, it’s our families and friends, girlfriends, girls, it’s us. The Resistance is strongest with the things we care about most. We’ll put off writing a novel for an entire lifetime because of the Resistance. We’ll make excuses for ourselves, we’ll let fear win. We’ll let the Resistance win. We’ll never take an acting class. We’ll wait until our web site is perfect before launching it. We’ll hold off on that business idea until the time is just right. Here’s some news for you – and me – the time is never just right, the web site will never be perfect, you’ll never sit down and write that novel until you sit down and write the novel. What are you putting off? Are you putting off what you’re doing right now? Are you holding off on that big project? Are you letting the Resistance win? Use the Resistance as your guide for what you want to be doing with your life. Your love for this project might not show itself like Bruce’s love for performing. It may show itself in the process. In the pride you feel when you wake up at 5 am seven days a week to work. Whatever you’re putting off, don’t deprive the world of your gift. Write the novel, start the program, take the class. Put pen to pad. Write your ideas down. Write your business plan, your rough draft, and your mission. The world will be better for it. Your life will be as well.